The Queensland Government is funding a call for tenders for a feasibility study of a proposed new wild dog check fence in Central Western Queensland which closed on 19 July. production. Wild dogs also cause many other impacts such as predation on native species, risks to human safety and ‘dilution’ of dingo genetics. Queensland and proactive producers currently outlay millions of dollars and countless man-hours per year to control wild dogs in an attempt to minimise the significant negative impacts of wild dog predation on the sheep, wool and cattle industries. For many years, the Blackall-Tambo, Barcaldine and Longreach Regional Shires as well as individual producers have spent millions of dollars on control programs. However, wild dog attacks and numbers of sightings of wild dogs are continually increasing. It is obvious that the current strategies are not working effectively. There has been and continues to be, an exodus from the sheep industry as wild dogs are continuing to inflict serious economic damage to livestock industries in central western Queensland. It is estimated that half the sheep properties in Queensland are outside the existing ‘wild dog barrier fence’. This poses a serious problem for the sheep industry in the long term. To address this problem it is proposed that a new check fence be constructed starting from the existing Wild Dog Barrier Fence south of Blackall and run north, west and then south encompassing country suitable for mixed grazing (sheep, goats and cattle) enterprises within the Blackall/Tambo, Barcaldine and Longreach Regional Council areas, incorporating a proportion of the Barcoo Shire, and finally rejoining the existing barrier fence. Wildlife Queensland is aware the study will focus predominantly on Central Western Queensland. how it would impact the communities within the Central West region. An analysis of any legislative (local, state, federal government) constraints (e.g.native title) impacting on construction of such a fence. research maintenance options and associated ongoing costs and an approximate proposed route for the fence. Wildlife Queensland does have concerns about the extension of the fence and the potential impact. Adequate consideration of potential environmental harm and threats to native wildlife have not been considered in the terms of reference. No doubt further fragmentation of the vegetation will occur should the construction of the proposed new check fence occur. How will such activity be minimised? What clearing either side of the fence will be required to reduce fence maintenance costs? Will the construction of the fence reduce the amount of broad scale baiting for wild dogs currently required? 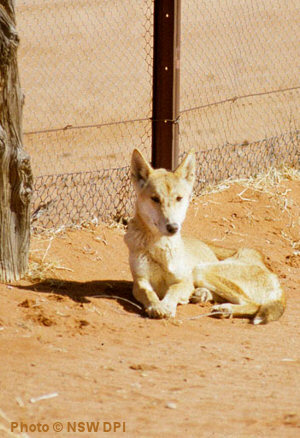 Can a check fence be designed to minimise harm to wildlife and at the same time, be effective for the control of wild dogs? Will the control of wild dogs have a negative impact on the control of feral goats and put endangered plants at more risk? Wildlife Queensland is writing to the RAPAD (Remote Area Planning and Development Board established by various central western Regional Councils) an organisation that is managing the tender process. Wildlife Queensland will also be writing to Biosecurity Queensland informing that Government agency of our concerns. It is the understanding of Wildlife Queensland that Biosecurity Queensland is providing the $30000 funding. For more information on Wildlife Queensland’s activities, call us on +61 7 3221 0194 or send us an email.